Pesto is a green sauce originating from northern Italy that typically calls for fresh basil and pine nuts. It can also be made with parsley in place of the basil and walnuts or cashews in place of the pine nuts. Some mint can also be added to the basil. The traditional recipe also calls for Parmesan cheese, but it honestly doesn’t lose much in term of flavor when omitting the cheese. Feel free, however, if you choose to eat cheese on your paleo diet, to go ahead and add Parmesan. It can also be an occasion to treat yourself with a little extra and cheese is far from a big deal to have from time to time if you’re otherwise healthy. It even gives you an extra dose of probiotics. 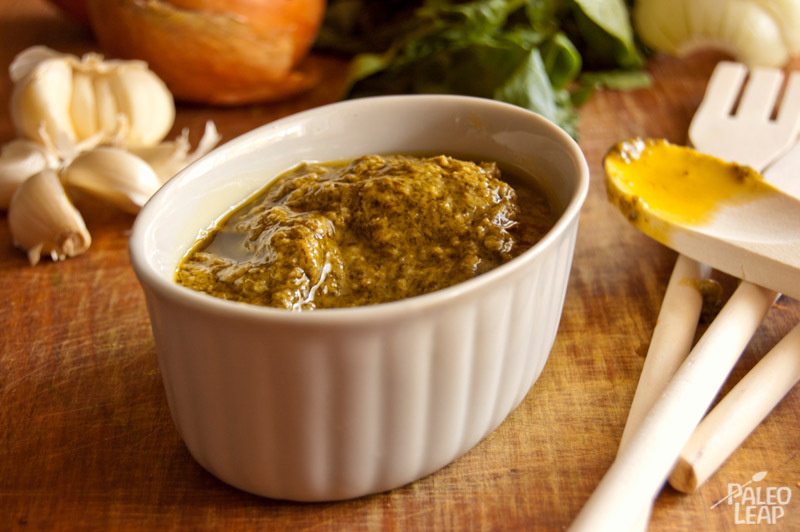 Pesto was traditionally prepared with a mortar with the help of a pestle, but a food processor makes the whole process much easier. You can also make in in a blender, but it’s a rather frustrating endeavor most of the time I find. You constantly have to stop the blender and toss the ingredients to try to make it blend properly. If you grow your own basil, you probably know that you often end up with so much basil all at once that you don’t know what to do with it. Making pesto is probably your best choice in that case. You can make a big batch and freeze any leftovers. Ice cube trays are a good way to freeze pesto. Simply pour the pesto in the small cubes, freeze and thaw any amount of cubes when making a recipe with it. Followers of a Standard American Diet will usually mix pesto with pasta or put it over toasts, but we can do better and use it on healthy food instead. It’s delicious either as a dip or as a sauce on roasted meat, fish or vegetables. I also like to make it the main attraction and simply serve it with pieces of chicken, tomatoes and black olives. Fresh pesto will last in the refrigerator for about a week. Put the basil, garlic and nuts in a food processor and pulse until everything is chopped. Add the olive oil and Parmesan, if using, and pulse again until smooth. Ice cube trays make a good vessel to freeze the finished pesto. Simply pour the pesto in the small cubes and freeze. When making a recipe with pesto, thaw a couple of cubes and you’ve got your pesto.